The Occupy Toronto movement has been granted an interim injunction against eviction. A judge will consider the constitutional issues posed by the protesters at St. James Park and deliver a decision by Saturday. 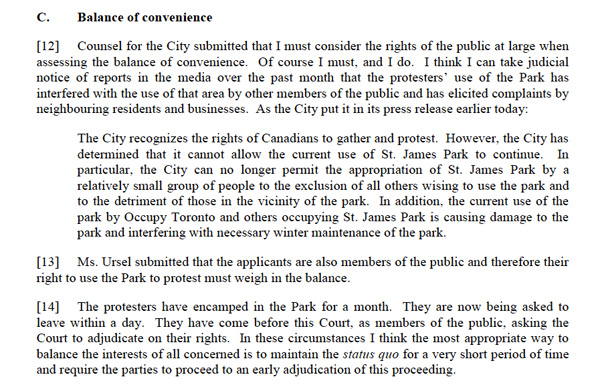 In the meantime, the interim ruling states that no new tents be set up at the park. A hearing has been scheduled for Friday morning at 10 a.m. at which time both sides â the occupiers and the City of Toronto â will be able to present arguments. Until the judge rules on the matter, the City in not permitted to enforce the eviction notices that were distributed earlier today. A rally is planned at St. James Park at 11 p.m. tonight. Here's a copy of Justice David Brown's decision regarding the interim injunction (PDF). Wading through the legalese, the crucial issue appears to be the "balance of inconvenience," which takes into account "the damage each party alleges it will suffer" as well as the general public interest. Here's a glimpse at the arguments that were presented today (for context, follow the link to the full report).